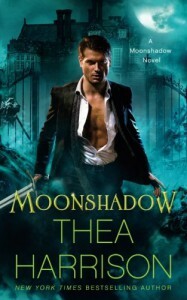 Thea Harrison’s MOONSHADOW is a thrilling start to the new series of the same name. LAPD witch consultant Sophie Ross is given the opportunity to travel to England to discover information about her childhood. She becomes involved with Nikolas Sevigny and his band of Daoine Sidhe knights of the Dark Court to try to overcome Isabeau, Queen of the Light Court. MOONSHADOW has a compelling plot that was exciting from start to finish. It was full of creativity and excitement. I like how Thea Harrison included characters from classic mythology, like Robin. I thought it was interesting how Sophie and Nikolas initially encounter one another. I love the concept behind the house and inheritance. Sophie is a likeable character. She is strong and likes to help those in need. I like how Sophie’s magic benefits the knights. My heart went out to the Knights, and how long they have been fighting to get back home. They are determined and powerful. It is understandable why Nikolas is cautious about outsiders. I like how Sophie’s and Nikolas’ relationship evolves throughout the story. Thea Harrison does a great job with both her character development and plot. There are numerous twists that make the story exciting. There are deceit and comradery. The story keeps you on your toes I like how MOONSHADOW ended. I look forward to the next book in the series. I voluntarily reviewed an advance reader copy of this book.